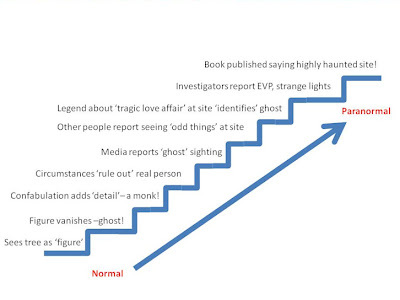 Props goes to fellow forum member, Cú Chulainn, for sharing a fascinating article on the way (alleged) paranormal phenomena can morph from witness to media. "How do you know it was a Bigfoot?" "It was large and dark and hairy and standing on two legs." Some people believe that paranormal phenomena are inherently unknowable . . . I have encountered the same position elsewhere; during a haunted house investigation in California for a TV show, I had a friendly discussion with a member of a ghost hunting group. I asked him why the evidence for ghosts never seemed to get any better, and he replied that ghosts were scientifically unprovable. I pointed out that his team . . . had brought with them a huge van full of thousands of dollars' worth of cameras, EMF detectors, and ghost hunting gadgets of all descriptions. What was the point of all that, I asked him? If he was certain that ghosts existed—and he was equally certain that their presence could not be scientifically measured—then all the high tech equipment they used was by definition worthless (pp. 53—4). There are certain methods I can't really talk about. But the Society get together to form a psychic chain and direct the psychic energy towards the person in question., a bit like an exorcism. We very rarely do this unless its a very serious case, and this was a very serious case. Though, when you think about it, if the paranormal can be examined through scientific means, then is it truly paranormal? Is it really supernatural? After all, if such phenomena can be 'measured' and demonstrated, consistently, doesn't that just make it natural phenomena yet to be verified with sufficient evidence? But if the evidence thus far isn't sufficient - at least, by scientific standards - then what exactly is being measured in the first place? Round and round we go. Don't get me wrong. I'm far from discouraging attempts to verify the existence of the supernatural via scientific means. On the contrary: knock yourself out! However, the paranormal, by its very nature, is an 'extraordinary claim' that requires extraordinary evidence. The evidence, itself, must withstand rigorous - but fair and reasoned scrutiny - to justify itself as valid 'evidence'. Every alternate solution should be exhausted before a paranormal explanation is put forth. When it comes to Highgate, how exactly do we prove that the cemetery was haunted by a vampire, ghost or 'psychic entity'? What is the evidence? To that effect, we are dependent on eyewitness testimony. But, as the 'paranormal escalator' shows, this, in itself, is not sufficient. Therefore, we have to examine the building blocks of which the case is composed. That's one reason I was asking about certain Victorian era sightings. Essentially, these sightings were being used to 'prove' that the cemetery had been 'latently' haunted and its descriptions paralleled contemporary sightings. If so, let's look at the source. Let's see if they do match or whether the claim was pulled out of thin air or, perhaps clumsily shoehorned into something that didn't quite fit. You can see how that went down. Therefore, the best approach I advise when examining the vampire/ghost/psychic entity is to examine the way the cases have been composed. What was the evidence the main protagonists used to arrive at their supernatural claims? Does it withstand scrutiny? Have all rational explanations been eliminated? Have the investigators displayed sufficient expertise - or deferred to it - to eliminate rational explanations? Are their accounts consistent? Are their investigative techniques sound? Are they prone to lying and misrepresentation? And so on. In the meantime, I highly recommend scoring a copy of Radford's book. It's also on Kindle, if you're so inclined. Innuendo is a passive-aggressive trait David Farrant revels in. Here's the latest example from his blog concerning a certain someone from 'down under'. I only wish he’d post the bloody things by land mail as at least then they’d take a week or 2 to arrive from his home by a nearby billabong. But no! He has to email them and they keep filling up my inbox so I am really forced to read them for amusement value. You know, the guy should really have been a comedian: I mean, talk about giving me potential ideas or scripts for the forthcoming film! You think I’m joking? Just you wait and see! I am not going to name the character here – as he has used my name enough already to further his own attempts at self promotion. I suppose it must just keep him happy – just trotting around the bush with nothing else apparently more useful to do! Is there a reason you're spamming me with your book list? As you can see, my so-called 'unsolicited' e-mails actually began with his unsolicited e-mail to me. Apart from muddying and misrepresenting the facts in his patent style, one could argue that he suffers from a tendency to psychologically project his own attributes to others, as I've shown before. That'd explain why he also 'blames' me for his own writings on the Highgate case. Onto the other comments in Farrant's blog entry. The 'upcoming film' Farrant refers to, is derived from his Bishop Bonky publications. It operates under the guise of satire, but is noticeably lenient on one of its 'targets': namely, Farrant, himself. That'd probably be because he published it through his BPOS imprint under the false pretext of 'free speech' (even though it was in violation of StripGenerator's copyright), served a consultant in its creation (this obviously throws the impartiality of the creator out the window—and what a dodgy mofo he turned out to be) and promotes related merchandise. Apart from these issues, there's a rather unfortunate streak of xenophobia present in his writings. The references to 'billabongs', our postage, etc. are obvious digs at my Australian background. The question is, how is such pathetic stereotyping remotely relevant to discussions on the case? What if I was another nationality, say, Indian for example. Would he take digs at my cultural background then? Either way, it's hardly coincidental that his snide postings have followed in the wake of my exposés on his inability to provide sources for his own claims. A clear sign of desperation. Presuming my comment gets published, I can already anticipate the response. The 'down under' character referred to wasn't actually me, but 'someone else'. Some other person who he 'coincidentally' refers to in the same derogatory manner as he does myself. Sad. As to 'land mail', is that really an advisable form of communication with someone who will openly boast about having your address...even when it's not willingly provided? It's a shame Farrant can't be more honest and openly admit that the Bonky stuff is simply another manifestation of his vendetta against Manchester as well as Farrant's critics (like me). Speaking of Manchester, his book From Satan to Christ: a story of salvation (London: Holy Grail, 1988) gives us a taste of just how vindictive and petty Farrant can be. The source of Farrant's 'grievance'? 'In due course it became evident that all he wanted was some text added to a caption beneath a highly controversial photograph in an earlier book which mentioned his trial at the Old Bailey. He admitted to being exceptionally sensitive about anything concerning this trial' (ibid). Manchester even 'agreed to amend the caption in further editions so that this fine point about a photograph used in evidence was clarified' (ibid). * I can certainly relate to that. Farrant has an annoying tendency to repeatedly avoid answering basic questions about his own claims and, when he does, it is in the most roundabout fashion and often not even directly related to the question being asked.